Mauritius, London 21 February 2019. 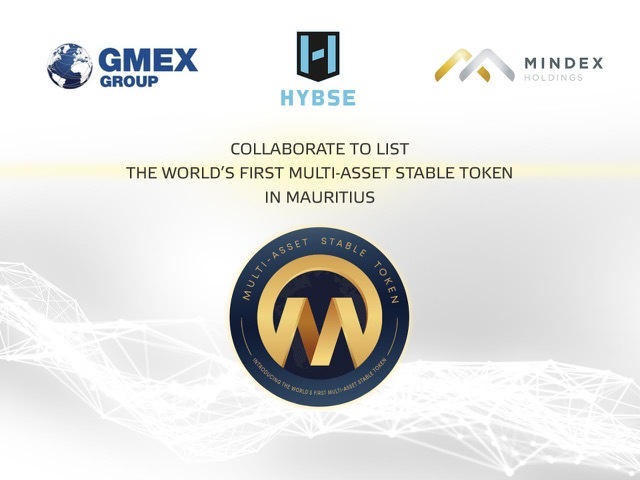 Following the recent joint venture launch in Mauritius between three visionary companies in October 2018, newly created HYBSE Marketplace Limited (HM) brings to centre stage a worlds first digital multi-asset stable token “MAST”. The first instrument to be issued will be the MAST products, full multi-asset backed tokens which will provide investors with a diversity of managed risk, as each asset class is underpinned by an integrated framework of strategic portfolios. Initially, MAST will be composed of ownership interest in the founding companies; HM, GMEX, MINDEX, fully gold backed DIM Currencies and stable gold coins. Three different categories of the MAST packages have been designed and enable investors to adapt their portfolio according to individual risk appetite. HYBSE Marketplace incorporates the latest technological advancements for the financial sector with three core elements; Security with GMEX market surveillance adaptors, provides access for total regulatory oversight for a secure trading environment; Decentralisation through public ledger provides transparent and secure methods of transacting digital assets across the platform; Scalability on the Catapult Engine allows for modular design and highfrequency trade volumes. With the GMEX Market Advancement Programme (MAP) we are keen to find ways to work with partners to bring innovative solutions to the market. Asset Tokens, which are fully backed, brought to the market on a regulated exchange and stored in a regulated digital custodian bring a level of regulation and oversight not previously available for institutional investor needs. Mauritius as a jurisdiction recognizes Digital Assets as an asset class for investment by Sophisticated and Expert investors. We strongly recommend investors to seek out independent financial and legal advice before engaging in any sought of business endeavour. Investors should fully ascertain the risks prior to committing any funds for investments. Regulatory Duties It is the responsibility of investors that want to purchase or hold the tokens described in this offering to research and inform themselves on all applicable laws and regulations of any relevant jurisdiction. This includes tax consequences with respect to purchasing, holding or selling these Multi Asset Stable Tokens (MAST) Tokens. Our company is not offering any legal, financial or business advice. In case of any doubts or questions, Please contact us. Investors must comply with all laws and regulations concerning know-your-customer, AntiMoney Laundering and Anti- Terrorism financing that may apply to them. Investors must obtain any permissions, approvals or licenses needed in order to purchase, hold or sell any MAST tokens under the laws and regulations to which they are subject or in each jurisdiction in which they may purchase, hold or sell MAST Tokens. We never sell to sanctioned countries. MINDEX Clearing Limited – operates as the central counterparty (CCP) clearing house regulated by the Mauritius Financial Services Commission (FSC) to clear all trades executed on MINDEX Limited. MINDEX Limited – operates a multi-asset Securities and Derivatives Exchange regulated by the Mauritius Financial Services Commission (FSC). MINDEX Vault Limited – The forthcoming secured storage depository solution for gold and other precious metals. MINDEX Refinery Limited – The forthcoming world class smelting, refining and recovery of gold and other precious metals to the highest standards. MINDEX Realty Limited – the real estate arm of the MINDEX ecosystem responsible for construction and operation of the refinery, vault, office building and warehousing facilitating the safe storage of gold, digital assets and other commodities. This is actually the kind of information I have been trying to find. Thank you for posting this information. Check this Bitcoin Investment plans and coinorbis Crypto Exchange. Here is you will find easy way of bitcoin currency transfer or converted with sell ethereum to western union and other more currencies just checkout now.